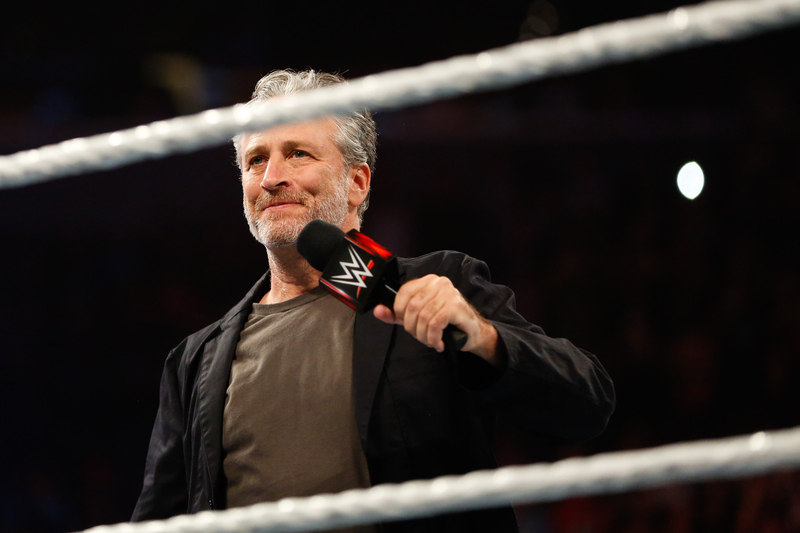 6 Post-'Daily Show' Jobs For Jon Stewart Including Professional Wrestling Because, Why Not? From the moment we found out about Jon Stewart's decision to retire from The Daily Show, there has been rampant speculation as to what his next career move would be. It's Jon Stewart, so we knew that it would probably be both cheeky and ridiculous, but who could have imagined that he would step into the wrestling ring next? Jon Stewart made his wrestling debut Sunday night in Brooklyn at the WWE's SummerSlam 2015 and the ever-unpredictable Stewart wasted no time before grabbing a trusty folding chair and hopping into the ring. Whether Jon Stewart will embark on a long-term career with the WWE remains to be seen, however, I think wrestling is a good look for Jon Stewart as a post-Daily Show job option. Since Stewart likes to keep us on our toes, though, I can't help but imagine these 6 post- Daily Show jobs for Jon Stewart that would be more ridiculous than a job in the WWE. Jon Stewart has always been a jack of all trades; his quick wit is just one of his many noticeable attributes, the others which include, but are not limited to, his flowing, silver locks and piercing irises. Jon Stewart's forays into the world of professional wrestling have us all asking what he'll do next. As far as I'm concerned, I will be pulling for Jon Stewart to follow one of these 6 career paths. Stewart already showed his chops in the ring and I would totally be down to see more of this, preferably with a more WWE-esque costume next time, complete with elaborate stage makeup, an epic entrance song, and an official wrestling name. The infamous robot that slings disses at the Big Brother contestants is one of the best parts of each season of Big Brother. But alas, as accomplished as CBS is, the Zingbot is not, in fact, an actual robot. Yes, there is a man behind the Zingbot mask. How great would it be if they unveiled the man behind Zingbot and it was none other than the man who has been Zinging people on The Daily Show for years? As an added twist, the BB production team could even make it so Zingbot is in the house for the entire show. Nicole Richie is one of my most favorite humans on this planet and if you haven't seen her reality TV series on VH1, you need to check out Candidly Nicole (and no one paid me for that plug, it's just that great). On a recent episode, Nicole spent the entire episode holding auditions for a Nicole Richie doppelgänger who would enable her to be in two places at once. How perfect would it be if Jon Stewart served some time as Nicole Richie's better half? That would make for some great TV. With the devastating news of One Direction's possible demise, the world was shocked. There seems to be a time cap on our favorite boy band and that's not okay. Perhaps the wounds would be healed slightly if Jon Stewart joined these British boy band babes for one last hurrah. I do love me some Chris B. Harrison but it seems like The Bachelor franchise is finally learning to poke a bit of fun at themselves and it's about time because the show is just a bit of a joke at this point (an entertaining one, but still a joke). How great would it be if Jon Stewart narrated The Bachelor and its sister shows? He could even co-host with Chris. Just imagine all the riffing that would go on. Because I had to put at least one realistic option on this list.